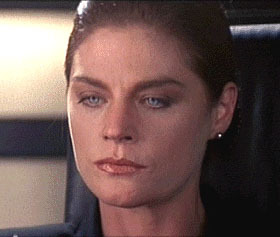 Meg Foster is a husky-voiced actress best remembered for her piercing, pale eyes, described by some critics as either sultry or vacant. In scathing reviews of her many horror movies, it became almost a cliché to read that Foster's eyes were the scariest part of the film. Her career peaked when she played Detective Christine Cagney on Cagney & Lacey in 1982. Loretta Swit had played the role in the pilot film, but was unavailable when the series was picked up, and the role went to Foster. After a half-dozen episodes, though, network executives became concerned that having two rather "tough-looking" actresses -- Foster and Tyne Daly -- might suggest that their characters were lesbians. Foster was fired and replaced by the much "softer" Sharon Gless, who became the "real" Cagney for most fans. Before and after her brief stint as Cagney, Foster worked extensively in stage roles and low-budget films. Because of her freaky eyes, she was often cast as blind women, evil predators, or lusty perverts. Joe Bob Briggs once wrote that Foster was "the Cruella De Ville of drive-in movies". Her memorable films include They Live with Roddy Piper, Blind Fury with Rutger Hauer, and Masters of the Universe with Dolph Lundgren.